Go Vacation is a surprising find. 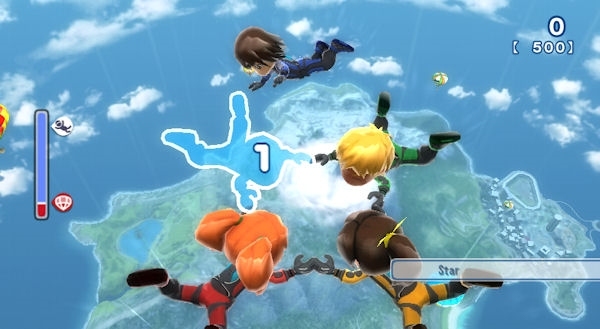 It's not just the number and variety of the minigames, but the fabulous island which makes simply exploring the world with up to three friends a real pleasure. As brought myself to a hesitant stop on the skiis - and thanking my luck for even stopping at all! - a weathered but youthful face leaned over and handed me a flier. The individual seemed uninterested in whether I cared about it or not. 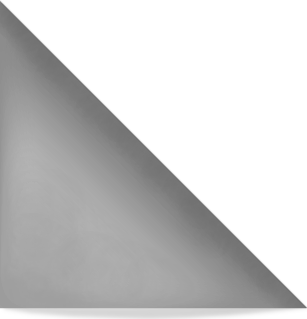 It was simply placed in my hand. It was an offer to take part in a skiing experience. I blinked and looked around me. How much more of a skiing experience was I going to get than simply skiing down a mountain? The young marketeer saw my confusion and explained, "its like skiing, but in a defined area with time limits and collectables and jumps. There's a prescribed start and end; plus, you get a score." I shook my head, "No, thank you. I'd rather just keep skiing, if it's all the same." It's looking pretty obvious that my partner and I aren't going to get a holiday any time soon. With projects piling up at her work and with both of us trying to plan a wedding (ed: congratulations!) it's looking more and more like the honeymoon will be our next chance to get away and that is a long way off. So, when I discovered Go Vacation, I bought into its premise almost entirely. If we couldn't go on holiday, then the holiday would come to us. Go Vacation looked like the perfect opportunity to spend some time together and find fun activities. As a holiday simulator, Go Vacation is startlingly accurate. There's an annoying holiday rep that pops up after ever activity and tries to create a sense of enthusiasm about your loyalty card and is forever recommending more and more things to do. My other half was getting pretty irritated with it, saying that she just wanted to relax and enjoy exploring and finding things for herself without being bothered every five minutes. 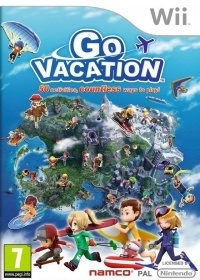 In fact, Go Vacation could not have been a more accurate holiday simulator if I had sat beside the Wii on a lounger trying to read a Doctor Who novel, while my loving fiancée complained about being bored and wanting to go and find something to do. As a holiday simulator, Go Vacation is startlingly accurate. Since we are disappointed about the lack of a skiing trip this year, we headed for the snow resort as soon as the game allowed. 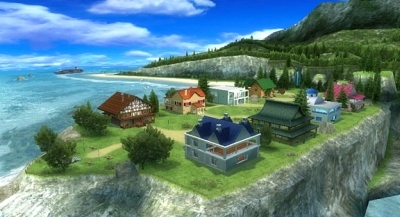 For me it is this resort that typifies Go Vacation, since while the minigames are fun in their own way, they are not nearly as enjoyable as simply taking a chair-lift to the top of the mountain and then skiing down to the bottom (ed: you really need to try the previous game Family Ski). It's an enormously entertaining distraction and coincidentally - should you be looking to research such a thing - a startlingly accurate primer for what to expect from a skiing resort. Each of the resorts brought similarly exploratory thrills. 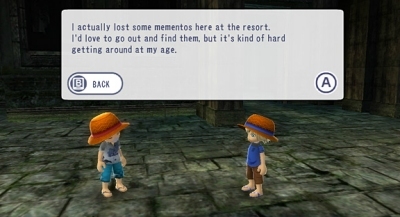 For me, it's the ability to wander around the open world of the island and find activities that is both Go Vacation's biggest success and worst mistake. 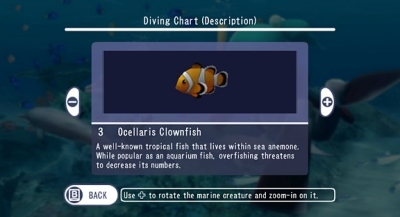 On the negative side, when I loaded up the game for the second time I really wanted to go Scuba Diving again, but couldn't remember how to find it on the island. This led to some very frustrating navigation of the whole area. But this complaint is minor compared to the joy the island brings. 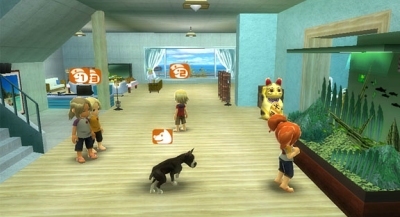 It amazes me that Nintendo haven't already tried this approach. 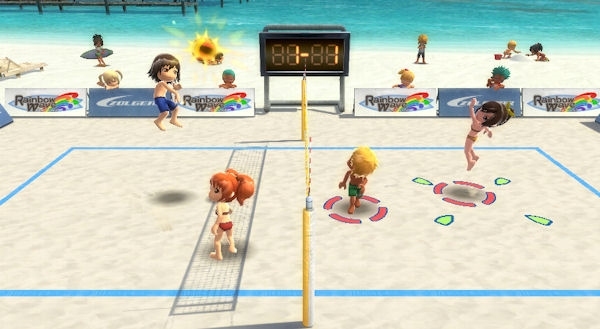 Go Vacation is arguably a thinly-veiled third party rehash of Wii Sports Resort, but for me it is the island exploration which makes it the better game. 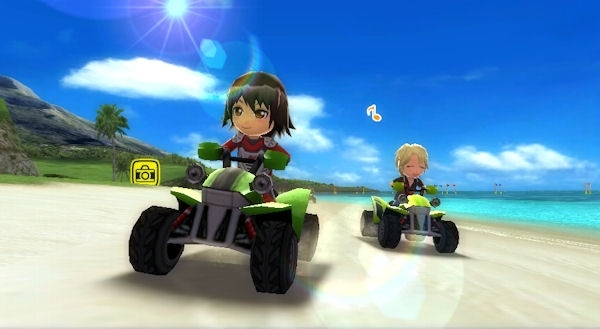 Nintendo may have spent a great deal of time and effort developing Wuhu Island and re-purposing it for Pilotwings Resort and Mario Kart 7, but they haven't realised the emergent gameplay possibilities from opening up the island for free exploration. Sure you can race on the road or fly through the natural caves, but I'd rather see what it is like to sit on the castle wall and watch the view; or put a go-kart on the side of the mountain and rush down to the bottom at top speed? 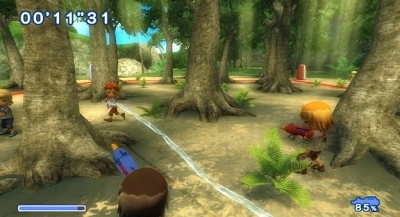 As individual games, many of the activities fall a bit short: the water pistol fights aren't as fun as other first-person shooters, the scuba diving isn't nearly as good as Endless Ocean and the jetski racing isn't quite as good as Wii Sports Resort. 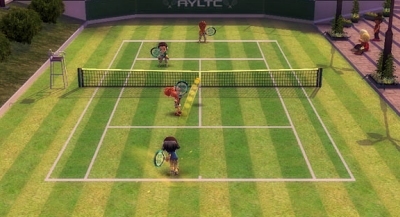 However, there is a far greater and broader variety of games here than most minigame collections. Combined with its open exploration, Go Vacation is much much more than the sum of its parts and delivers an overall escape that it almost without comparison. Where GTA IV goes on holiday to get away from all the stress and violence. 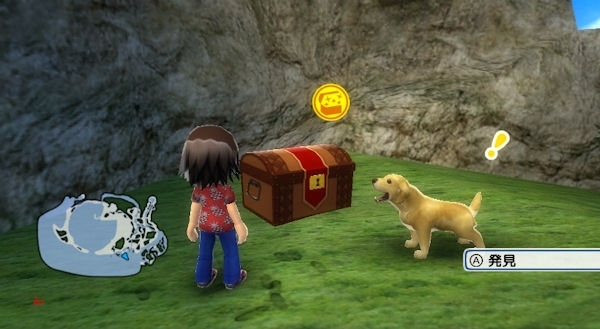 In Go Vacation's packed island, there are treasure chests, subquests to find and complete and hidden spots to have photos taken. It's the pleasure of exploring an world and finding either a hidden game or even just a piece of land to exploit for jumps and tricks. 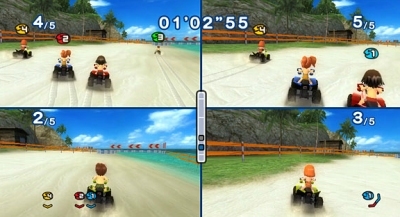 In two-player mode, we were impressed at just how far we could wander away from each other. Most games rubber-band the players together, but we not only managed to ski down opposite sides of the mountain, but at one point she was taking a plane tour over the bay, while I was enjoying a boat trip through the forest river. It I had to choose one word to summarise Go Vacation, it would have to be Freedom. 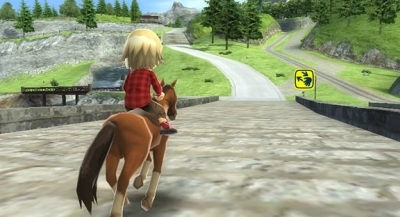 Go Vacation is where GTA IV goes on holiday to get away from all the stress and violence. The pleasure of playing Go Vacation is the holiday-like joy of simply being off the clock to wander around un-pressured and take part (or not) just for the sake of it. It will certainly do for me, at least until I can get away for real. Chris Jarvis writes the Novel Gamer column. "I write stories to say what I think about games, for me it's the only way I can really communicate what I feel about them. Do you ever have a response to something that's hard to put into words? I find that sometimes I have something to express that can't be communicated by trying to explain how I feel, directly."